Sierra Leone’s Deputy Minister of Information and Telecommunications Hon Theo Nicol has while attending the twelfth ECOWAS Telecom/ICT Ministerial Meeting in The Gambia, explained out to the Sierra Leonean Community what the AGENDA FOR PROSPERITY and the present on-going CONSTITUTIONAL REVIEW is all about. 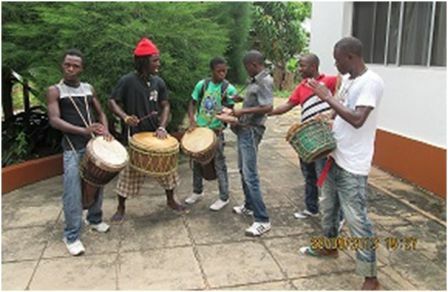 Opening the meeting which was also attended by members of the Sierra Leone delegation to the ECOWAS Meeting and graced by the UNITED NATIONS Representative (UN One) to The Gambia (a Sierra Leonean) Mrs. Ade Lekoetje (Nee Aforo) with the beating of traditional drums and music, High Commissioner Mohamed Kemoh Fadika, commonly referred to as “The PA” introduced the Minister and the subject he would be speaking on. He informed that the Inspector General of Police has referred to Sierra Leoneans in the Gambia as peaceful and the best behaved and that he is getting the best cooperation from citizens especially from members of the Sierra Leone National’s Union. 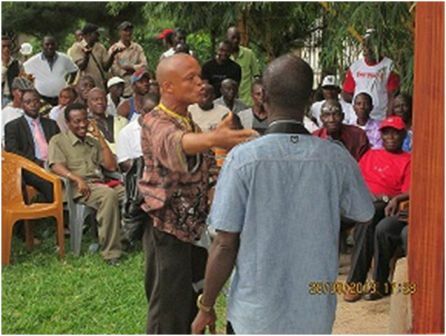 Speaking to over 1,000 citizens including a large turn- out of SLPP members in their party attire at the official residence of the High Commissioner at Fajara, Mr. Nicol welcomed them to what he referred to as “A NEW DAWN IN SIERRA LEONE” as some of them have been out of their country since the then conflict. He extended to them warm greetings from President Ernest Bai Koroma and the people of Sierra Leone and commended them for being law abiding as they go about their fields of engagement in teaching, nursing, football, schooling and business. According to the Minister he has been mandated by President Koroma to deeply explain out to them and the world at large, what the AGENDA FOR PROSPERITY and THE CONSTITUTIONAL REVIEW is all about. He continued that when President Koroma came to governance he rolled out the AGENDA FOR CHANGE which comprises Health, Education, Infrastructure, Electricity and Agriculture. “Having to a large extent achieved all that, The President thought it prudent to push on with the AGENDA FOR PROSPERITY enclosed in 145 pages that would eventually lead to our country by 2025 being a Middle Income Country like Singapore and we will reached a stage whereby we will stand up for ourselves and not go cap in hand begging” he said. Minister Nicol further informed that the country, has so far realized over LE 15.000B from iron ore exports and over 13.000 employments gained in AFRICAN MINERALS alone. With regard Youths he informed that a separate Ministry of Youths has been set up and a Youth Commission also set up, to deal in training and employment of Youths. 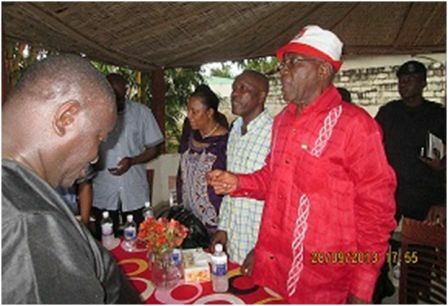 “President Koroma is ready to die for the Youths as he himself did indicate. My people there is no way, the concerns of the Youths will be henceforth compromised”. The Hon. Minister also informed that it now takes less than 48 hours to register and set up a new business and also spoke of the new and improved airport and facilities, the discovery of oil and to determined its commercial value, the Judiciary, Bumbuna Face 2, freedom of speech and that of the Press, freedom of movement and association. In short, Minister Theo Nicol took his time to explain into details what the AGENDA FOR PROSPERITY AND THE CONSTITUTIONAL REVIEW is all about and government’s determination to make our country a better nation to be envied by the world as a whole. “My dear brothers and sisters, Sierra Leone as a nation under the rule of the APC is moving and growing positively and I tell you no lie; no weapon fashion against us shall prosper. All that President Koroma is saying to you is – PREPARE YOURSELVES TO GO BACK HOME- thereby making your own contribution to national development” he said. During questions and answer time, questions were asked regarding the state of electricity, Bumbuna, water supply, State security, Youth training and employment, network providers credit cost, Education, infrastructure, Agriculture, general employment, State of the economy, freedom of speech and Press, state of the SLAFA League, Banking system and micro credit, Tourism and Governance at large. They further asked for clarifications on the AGENDA FOR PROSPERITY and that of THE CONSTITUTIONAL REVIEW. Again the Minister took extra time to give appropriate answers to all questions asked. 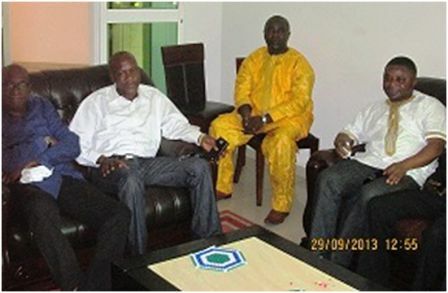 With regards exchange of culture and tourism between Sierra Leone and The Gambia as a whole, the Head of Chancery Andrew Kamara in the High Commission, informed that meetings had been held with the Minister of Tourism in The Gambia and modalities have been put in place for both Tourism Ministers of Sierra Leone and Gambia to exchange visits and help in the promotion of culture. All Sierra Leoneans at the meeting expressed thanks and appreciation to President Koroma and his government and thanked the Minister for what they say is a show of good governance. They said they have finally got a better and clear understanding of what the AGENDA FOR PROSPERITY AND THE CONSTITUTIONAL REVIEW is all about, noting that earlier they had listened to and relied on rumors. They promised to continue giving their support to the government and to work in close collaboration with High Commissioner Fadika and Staff.